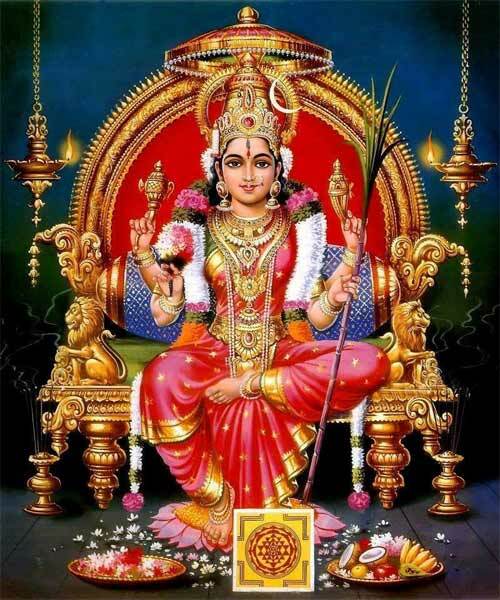 Lalita Panchami Vrat, or Lalitha Panjami, is a highly auspicious day during the nine-day Navaratri festival. It is observed on the fifth day of Navratri. In 2019, the date of Lalita Panchami is October 2. It is dedicated to Lalita Devi, a form of Shakti or Mother Goddess. She is associated with the Pancha Mahabhutas or five elements. Goddess Lalita is believed to be the representation or form of the five elements –earth, water, air, fire, and space. The day is of great significance in Gujarat and parts of Maharashtra. Some people also observe a fast known as Lalita Panchami Vrat. It is believed to bring wealth, happiness and knowledge. Goddess Lalita is an incarnation of Shakti that appeared to annihilate demon Bhanda who was created from the ashes of Kama or Manmata. Kama had tried to disturb the intense tapas performed by Shiva. An angry Shiva opened his third eye and reduced Kama into ashes. One of Shiva’s Ganas took the ashes and drew a portrait of a man and when Shiva glanced at the figure it came to life and blessed him. Bhanda after getting the blessings of Shiva started rule the world and showed demonic characteristics. Indra performed a yajna and Shakti appeared sitting on Sri Chakra in the form of Lalitha. Bhanda was killed and his original form of Kama or Manmata was restored.